Happy Friday! As I said in the previous blog post, I have been in kind of a funk. I haven't had much motivation to workout, but then I remembered that I was linking up with Courtney from Eat Pray Run DC, Mar from Mar On The Run, and Cynthia from You Signed Up For What? 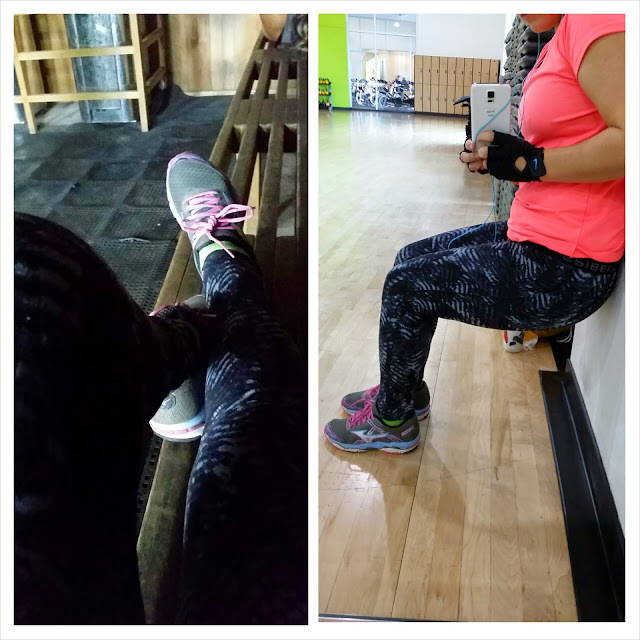 for Friday Five: Fitness Snapshots. I started looking through my phone gallery and found some great pictures that truly represent me. Fitness can be found in so many shapes and forms so it was fun to compile my favorite five. This is exactly what I needed to get my workout mojo back! 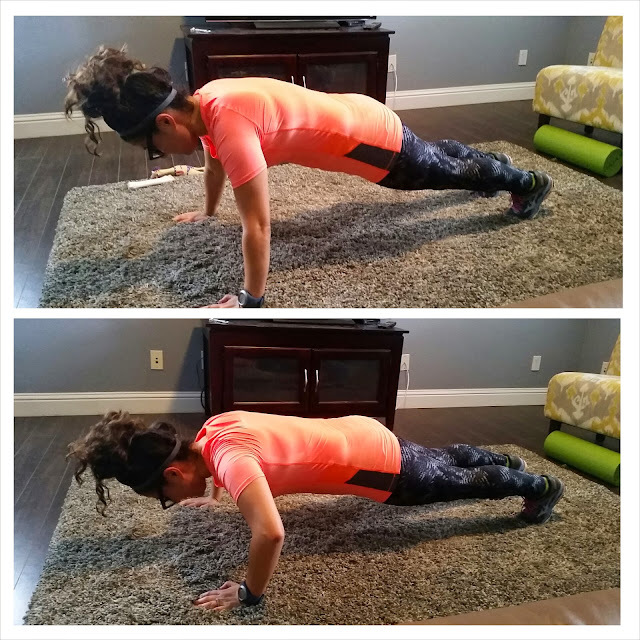 PUSHUPS: I have made a goal for myself to really improve my form and do a lot more than 5! Yeah I am pretty bad when it comes to pushups. Luckily my husband has really been working with me. I can already see progress! 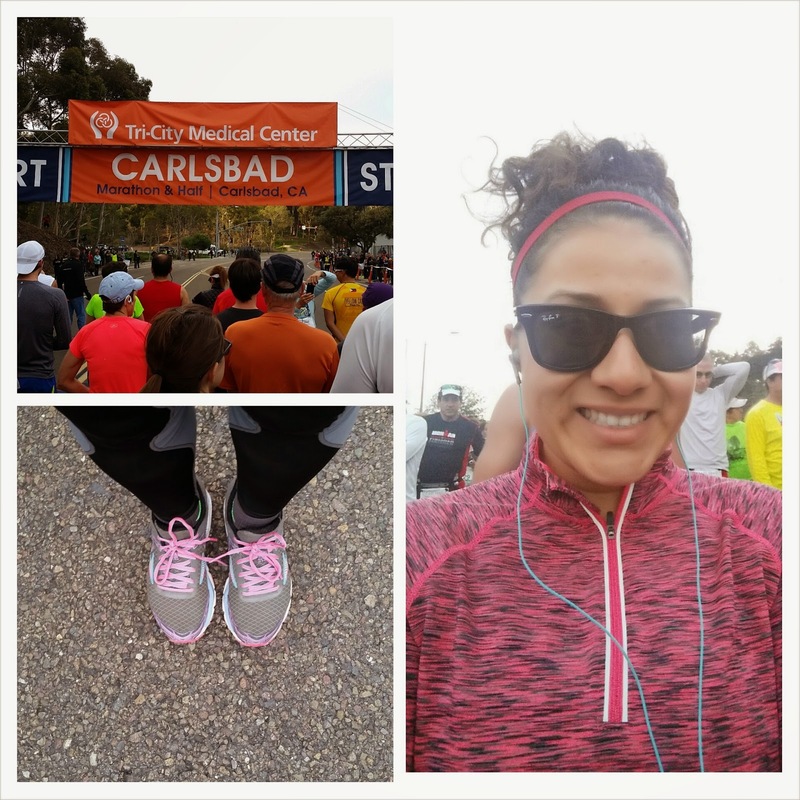 RACES: This picture is from race day for the Carlsbad Half Marathon. It was my first race of the year and I did exceptionally well considering I have been battling with plantar fasciitis. Seeing this picture brought me such joy because it was the last long run I've done and I am just aching at the chance of doing my next one. GYM WORKOUTS: I love going to the gym because I have so many options to choose from. This picture was all about wall-sits and some much needed sauna time. You can usually find me on a treadmill and then hitting the free weights though. SNOWBOARDING: Like I said you can get a workout by doing so many other things than just running or hitting the gym. 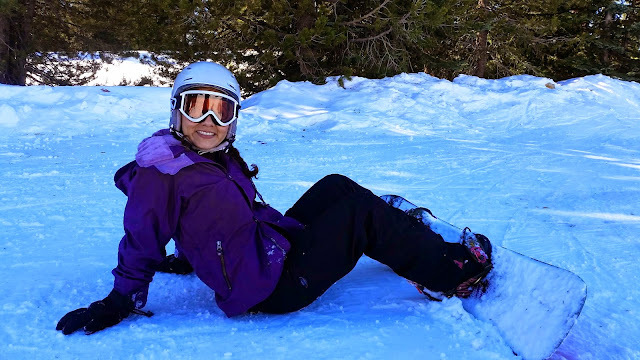 This year I went to the snow to snowboard and man was it a total leg and core workout! I was sore for quite a few days afterwards. 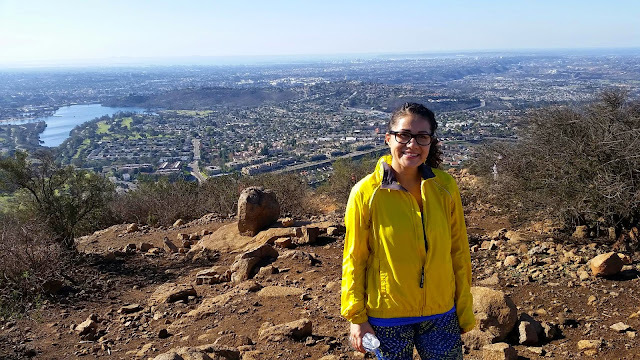 HIKING: When I came down to visit family over the holidays I was able to squeeze in a quick hike. It was beautiful since it has 360 degree views of San Diego. Not only did I get a good workout but I was able to marvel in the beauty of my hometown city. I miss it there and hope to move back someday. These are great pics, Daisy! I'm feeling pretty motivated by them myself, so I can see how looking at these may have given you a little push in the right direction. Kudos for your snowboarding adventure; I think it looks both fun and super-scary. Ha! Hope you have a great weekend and thank you for sharing these with the Friday Five! Thank you so much for your comment. Hope you have a great weekend too. Nice fitness snapshots! Great job working on pushups! I miss snowboarding, I haven't been in years but would like to again. It is definitely hard to get back into snowboarding. I took a 3 year hiatus and boy did I see the difference. It was a great surprise for sure! Way to go with the push-ups!! I know you'll continue to get stronger and be able to do more push-ups :) Happy Friday!! Nice job on the pushups! I have been trying for months to go from on the ground to straight up and still can't do it. And that's awesome you did so well in your race even though you had PF! Jennifer it is really hard. I still don't like pushups but it is definitely helping. Baby steps and progress. You look awesome in those push up photos. I have been trying to improve my core too and need to add push ups into the mix. I love to ski, but have never tried snowboarding. I think I'm too old to start now! Have a great weekend. Nonsense! It is a great sport and a lot of fun. I am jealous of your pushups! It's something I cannot do because of my elbow. The snowboarding looks incredible. How fun! Oh that is a bummer about your elbow. Hope you have a great weekend. Thanks for stopping by. Good luck on your race! I just love all of the running swag from races. looking good on the pushups! I'm a little (oh a lot) behind on my blog reading but sorry to hear you're in a funk. Between the weather and the winter I get it. hope you get some relief soon! Thanks Mar! Hope you have a great weekend. You should really try it Courtney! It is really fun. Hope you have a good weekend. Great pics! You seem to really enjoy being active outside, no matter what the weather. I've got plans for a bike ride with friends on Sunday, plus a solo run and a swim tomorrow. I love being in the outdoors! I have been meaning to go on a bike ride for awhile but I have been concentrating on my running. Great pictures. I've only snowboarded once, but it was pretty fun. Enjoyed it. Something I plan to try again some day. It is a lot of fun. I wish we had more snow in order to make more trips. Great job on the push ups!!! To stay fit and active, we need regular workouts and proper diet plan under a professional trainer. Physical fitness is essential for every human being and therefore, we are following different types of exercise programs as mention in this above article. I would like to follow up the above instructions to enjoy a healthy lifestyle and stay fit and active.